Photo credit: Stacy Spensley. Shared under a Creative Commons license. Click for more information. 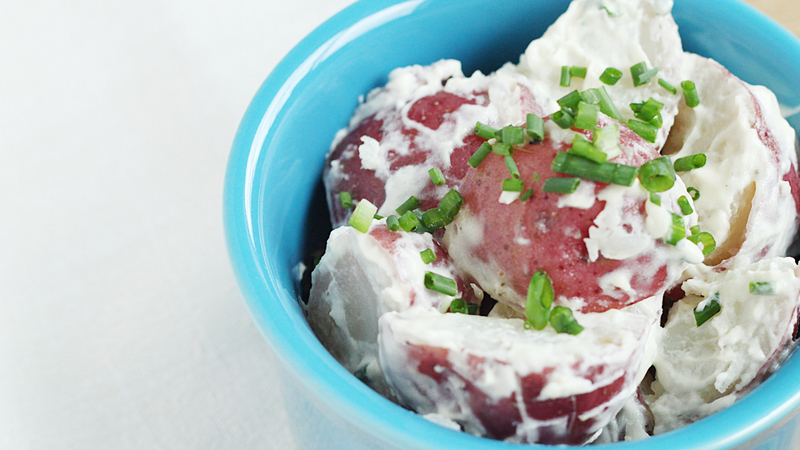 When folks get sick after a picnic, people often blame the potato salad. Or the chicken salad. Or whatever other side dish was made with mayonnaise. But that’s usually not the culprit. When it is the potato salad, the culprits are usually Staphylococcus aureus or Clostridium perfringens. And a combination of factors can lead to problems. In most “salads” of this type, low-acid potatoes, chicken, pasta or hard-boiled eggs are added to the mayonnaise. The mayonnaise is acidified to make it safe, but the low acidity of the potatoes (or foods) offsets the acidity of the mayonnaise, creating an environment where bacteria can thrive. That sets the stage. Then poor hygiene comes into play. S. aureus, for example, can often be found on our faces, particularly around the eyes or nose. So, S. aureus can be introduced to salads when people touch their face and then – without washing their hands – touch the food. However, in order for bacteria to become a problem, there also has to be “temperature abuse,” meaning that the potato salad isn’t kept below 41°F. So, it’s rarely the mayonnaise. Instead, it’s the combination of mayonnaise and other salad ingredients, plus poor hygiene and poor temperature control. But, in rare cases, it can be the potatoes. An outbreak of botulism poisoning in 2015 stemmed from potato salad made using potatoes that had been canned improperly by a home cook. A big reason that mayonnaise rarely causes foodborne illness these days is that most people buy their mayonnaise, rather than making it from scratch. However, many mayo recipes for the home cook don’t include acid, which makes it possible for pathogens – like S. aureus, C. perfringens and Salmonella – to grow and become a health risk. If it’s probably not the mayonnaise salad, what are the more likely culprits behind foodborne illness? The answer may surprise you. “Fresh fruits and vegetables are responsible for more outbreaks of foodborne illness than any other type of food; they’ve been linked to 46 percent of foodborne illnesses between 1998 and 2008,” Chapman says. That does not mean that you shouldn’t eat your fruits and veggies. Just beware of risks. Unfortunately, in most cases, contaminated produce was contaminated before the consumer bought it – at any point between the field where it was grown and the shelf where the consumer picked it up. First, you really want to avoid cross contamination, which is when pathogens from uncooked food (like raw meat) are transferred to food that’s ready to eat. That can happen if you don’t wash your hands, for instance, or if you use the same cutting board for cutting chicken and preparing salad. You can also reduce risk by washing your produce – though that won’t eliminate risk altogether. And, if you are growing your own fruits and vegetables, make sure you’re that you are following some fundamental food safety guidelines for gardeners: using a clean water source (not your rain barrel); keeping wildlife from contaminating your garden; keeping your hands and gardening gear clean; and not using uncomposted manure. As for grilling, check out our “5 Things You Should Know About Grilling Burgers (To Avoid Getting Sick).” There are good tips in there! Statement says: “Potatoes need to be ‘pressure canned,’ using a boiling water bath,” Chapman says. Kind of sounds like you’re saying the can be canned with a water bath canner as opposed to a pressure canner. Maybe I’m reading it wrong. Nice article. Didn’t realize fruit and vegetables were so responsible for illness. Good catch, Steve. It should read that potatoes need to be pressure canned — NOT using a boiling water bath. We’ve corrected the text. Agh! there’s a major error in your article. I’m a University of California Extension Master Food Preserver and I’m very concerned about this error. Pressure canned, YES, but NOT using a boiling water bath!!! You cannot pressure process in a boiling water bath. Pressure canning requires a special pressure canner, basically a large pressure cooker. All low acid foods like vegetables, meat, and seafood must be pressure processed for safety. Boiling water bath is suitable for high acid foods like fruits, pickles, preserves, etc. This article gives dangerously wrong information, please edit asap!!! You’re absolutely right. That was a typo. It’s been fixed. Thanks for mentioning it!